Cut It or Keep It? YOU Decide! I have been thinking about getting my hair cut for quite some time. The last time I had an appreciable amount lopped off was a couple of summers ago. The ends are getting split, so I'm definitely due for a trim. Here's my dilemma: My hair is at a length right now that is very easy to braid and put into a bun. However, my head starts to hurt if my hair is in a bun for very long. Also, I never curl my hair anymore because there's no point: the curls just fall out of my heavy hair. So, I've decided to let YOU, dear readers, decide for me! I would get my hair cut to about the length in the photo to the left - maybe a little longer (I would be going for collarbone length). 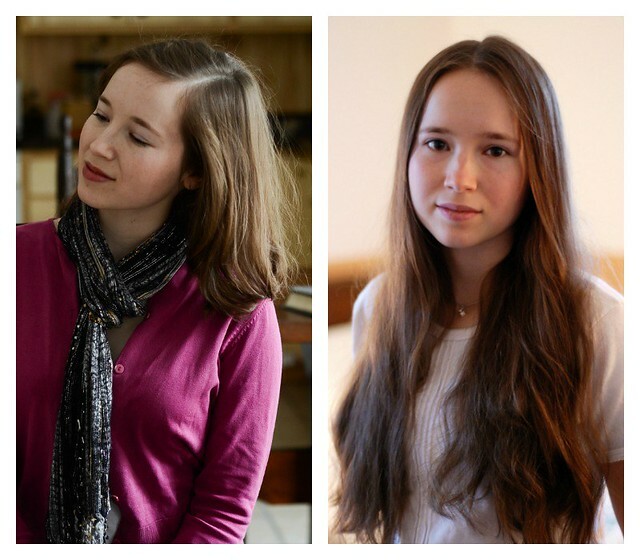 Right now my hair is almost as long as it is in the photo on the right (maybe a bit shorter). BTW, that photo was taken when I was 17. Woot. So, just leave a comment saying, "Cut it!" or "Keep it!" You can give me your reasons for chopping it or letting it stick around if you like. I'll tally up the answers next Tuesday and let you know the results! Keep it, mostly! Unless it just hurts too much. Maybe cut a few inches off and see if that helps. My hair was about your length when I cut off 12" last year and I love it. I plan on keeping it short now, as I love how easy and simple it is to take care of. I like the idea of cutting just a few inches off...I'm in the process of growing my hair out right now, and it is taking FOREVER! I love longer hair, but it shouldn't hurt you. Plus, you can always subtract very easily; cut a few inches off, and if it's still too much, cut a few more off. Cut it and go for a sleek/professional/new mom look. The long hair is so high schoolish/college cheer leader looking. You are a grown-up! Cut it! It will shape your face in such a lovely way. Cut - Cut - Cut! Definitely cut! You'll look much more stylish! Keep it! I am a long hair advocate and plan to never cut mine short, even when old and gray. I find long hair easier to take care of but then I don't style it much. I personally like how you had it in the photos of your birth announcement. So, I say, cut it! Cut it! I like the volume it gives your hair short. I think the longer hair makes you look too young. I have very long hair and so do my daughters.We love it. You looked very nice in your "pretend" cut picture. That length looks like it would be easy to manage especially with children. So I suggest you cut it. Cut it. It's easier to take care of, takes a curl and if you get a bob, you can still pull it up for formal occasions. Let Helen have the braids when she gets more hair. Both are really beautiful. But it sounds like you want to cut it. I have short curly hair so I can't relate to long hair problems, but the shorter hair looks shiny and lovely. Cut it! I think it frames your face better when it's shorter. And it gives it more volume. keep it! It's so pretty and mermaidy, just a trim and you'll be good to go! Cut it. You'll be thankful in the summer when you don't have to choose between a headache from keeping hair up or roasting under all that hair! If you decide to cut your lovely hair, it can be donated to an organization called "Locks of Love", I don't know anything about them but I'm sure you could google it. It might be hard to do, but i'd say cut it to that cute chin length. i'd like to do the same, but my hair is so curly it wouldn't work and my husband is not into it :-( and he does have to look at me. but you look really cute with shorter hair!!! If you cut your hair, why not donate it to locks of love? Keep it!!! I don't think many people can pull off really long hair, but I think you can. Chop it off! You're so pretty you don't need to hide behind you're hair. Once you get use to it you'll never go back, I promise! Can't wait for you to chop it off - hurry! You'll look super with it short! Ruben will love it and you'll be able to curl it. Just the right thing for Spring. Keep it--your long hair is gorgeous. Just braid it and let it hang if the braid hurts. It is distinctive and beautiful. I want to say keep it but with summer coming and the weight of it, go ahead and cut. Locks of Love! Can't wait to see how super you'll look with it cut! I vote with the cutters--just not too short. Will we see you tomorrow with a cute, spunky, all-the-rage bob? Hope so!